The venue’s foodie credentials speak for themselves: owner Nathan Muir, now head chef at the New Inn in Backwell, transformed the Robin Hood’s Retreat from a fairly run-down local pub into a smart gastropub that’s still maintained its crowd of local drinkers in addition to those who visit for the food. While the menu’s prices may put some off (around £7 for a starter and between £14 and £18 for mains), an early evening deal of £14.50 for two courses or £18.50 for three (which also runs all day Monday) is also available, with supplements to pay for the more expensive dishes. 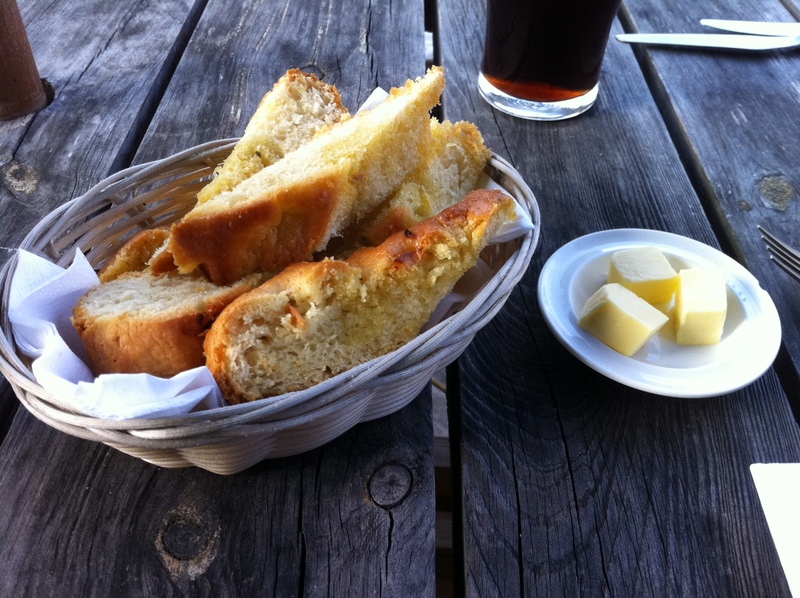 While we browsed the menu, we were presented with a basket of sliced rosemary focaccia, a loaf of which we had been eyeing up as we walked through the pub to our table in the sunny courtyard garden at the back. The bread was beautiful, soft and oily in the middle with a lovely crisp crust. It could possibly have done with a little more salt, but it was delicious. 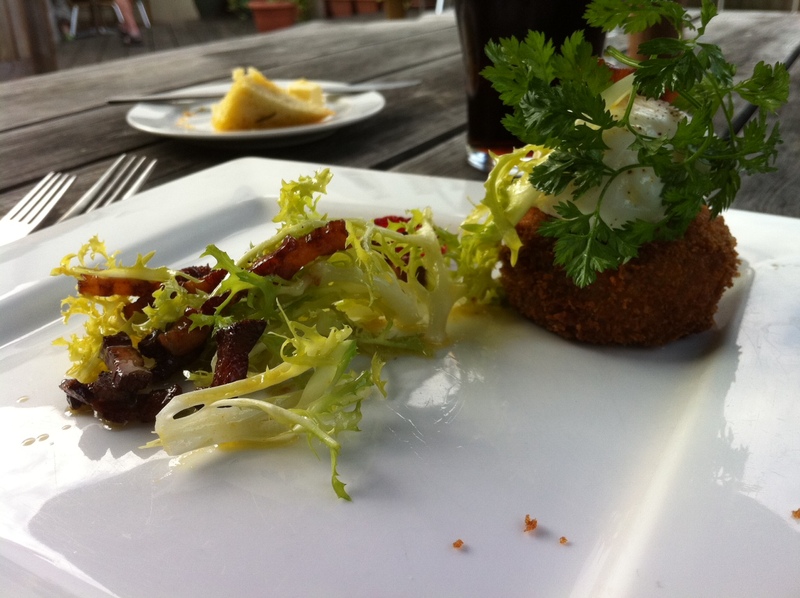 Back to the menu…and, intrigued, I decided to go for the deep fried pig’s head (£6.50), served with a poached hen’s egg and a frisee and lardon salad. The pig’s head was fantastic: shreds of wonderfully rich and tender meat (pig’s cheek, I think?) encased in breadcrumbs and deep fried. This was topped with a soft poached egg and a salad including salty, crisp bacon lardons – lots of flavour in this starter! We were also impressed when our waitress offered to refill the bread basket without hesitation when she brought over our starters…she was absolutely fantastic – very friendly, knowledgeable and customer-focused – throughout our entire meal. 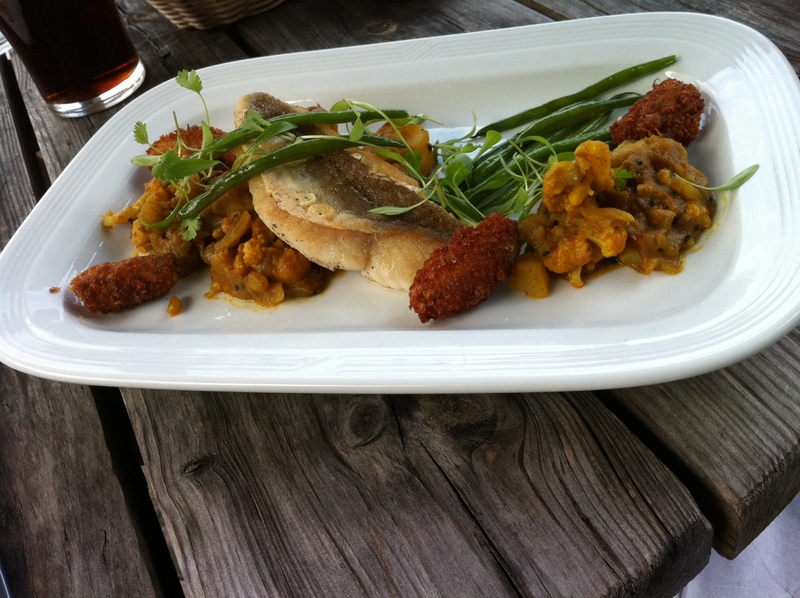 I don’t normally order fish options when I’m out for dinner, but was swayed by the pan roasted fillet of gurnard (£15.95). The flesh was firm and there wasn’t a bone in sight, and the crisp skin had tons of flavour. I was concerned as to whether the aloo gobi would overpower the flavour of the fish, but instead it complemented it: discs of potato and small cauliflower florets in a fragrant spicy sauce with just the right amount of heat. I’ve never had mussel fritters before but they were fantastic, perfectly cooked, and provided a nice contrast in texture to the rest of the dish. 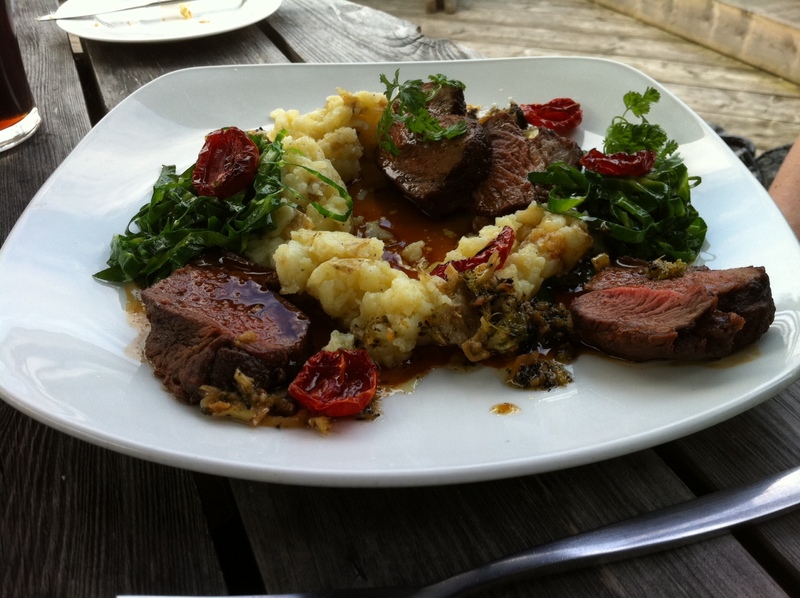 Sarah opted for the roast rump of lamb (£15.50), served with a huge portion of crushed new potatoes, oven dried tomatoes, charred broccoli and a preserved lemon dressing. It was a beautiful dish, and, unsurprisingly, she cleaned the plate. 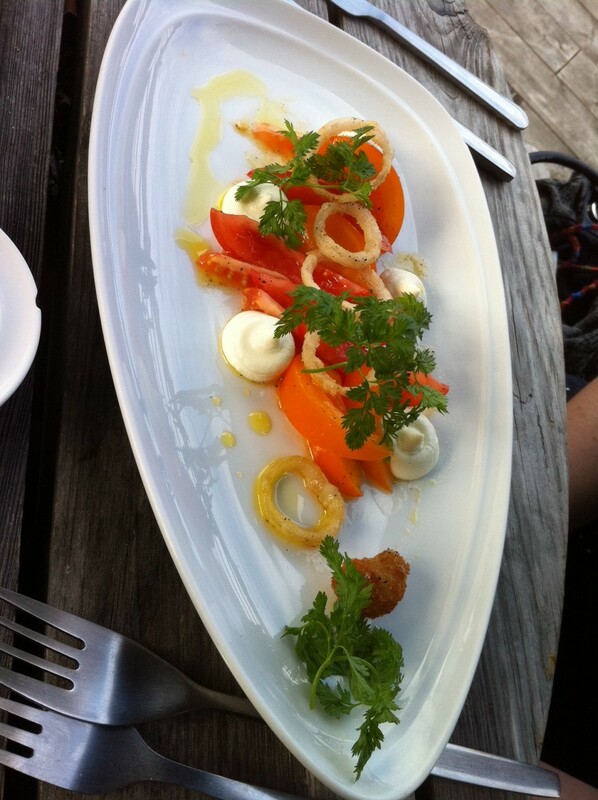 Her feedback: “Everything on the plate was really savoury, so having the sweet oven-dried tomatoes was a touch of genius. the lamb was perfectly cooked, it was still pink but had crispy edges, you can’t get much better than that! 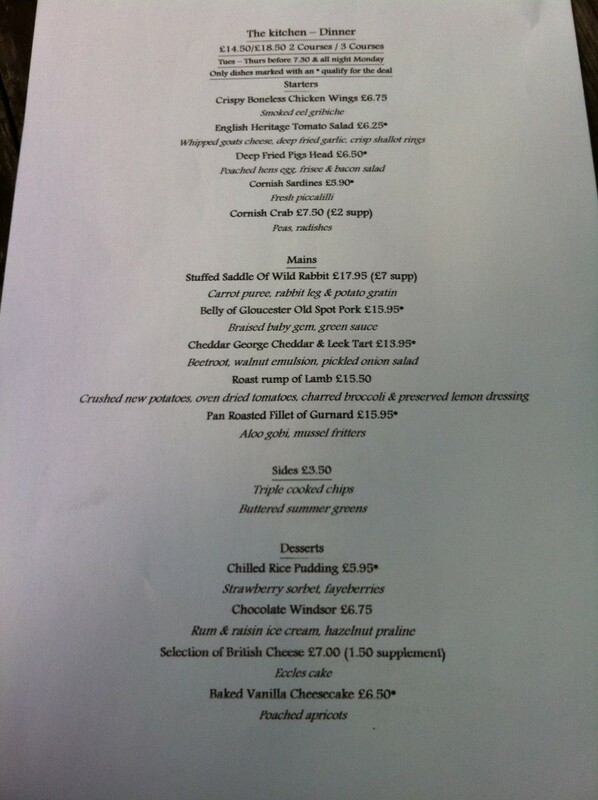 Unsurprisingly, I went for the “Selection of British Cheese” (£7 – £1.50 supplement if ordering from the early evening menu) rather than a dessert. 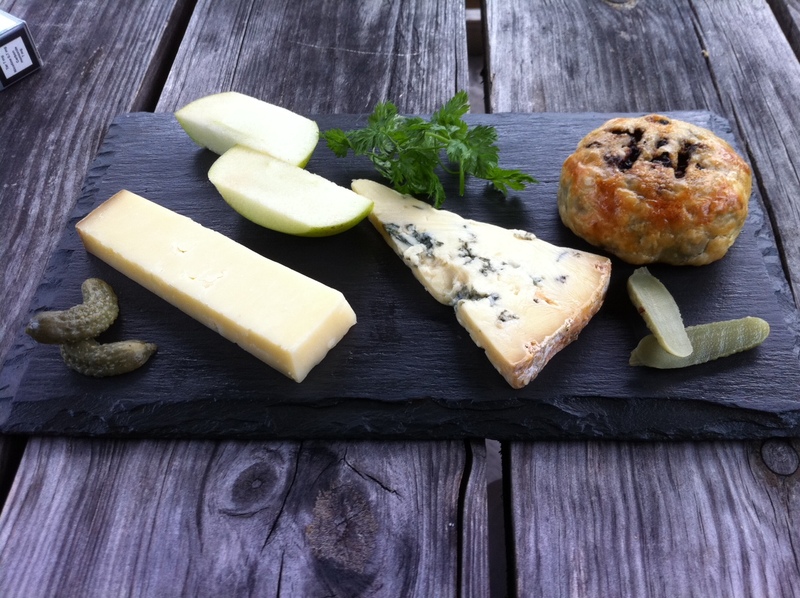 The menu didn’t state which cheeses I’d be getting – and I didn’t ask – so I was a little disappointed to see a Colston Bassett Stilton and a Quickes mature Cheddar on the slate in front of me. Don’t get me wrong – the cheeses were great, and had been left out of the fridge before serving, so the flavour was fantastic – but I’d rather see something a bit different (and local) on the menu in a place like this. The apple slices and cornichons with which the cheese was served made sense…the homemade Eccles cake didn’t – at least till I tried it with both of the cheeses. The sweetness of the pastry and the currants combined bizarrely well with each of the two cheeses, both of which were quite strong in flavour. Will definitely go again – LOVED the food here! Nom! I am craving some more of that cheesecake especially! Nom! 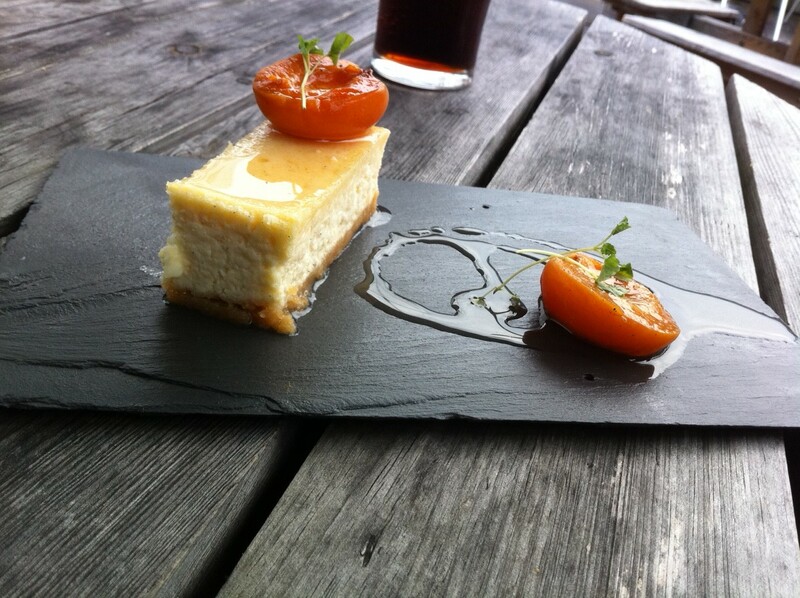 I'd definitely go for a dessert next time rather than cheese!